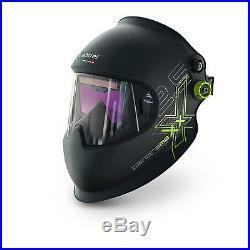 Optrel Panoramaxx Welding Helmet (1010.000). Optrel's e684 and Vegaview helmets made a baby - the new Panoramaxx. Optrel's Panoramaxx helmet (1010.000) offers six times the field of view compared to a standard ADF. This helmet has an ergonomic nose piece that allows the helmet to sit closer to the face, thus offering a much wider field of view. The Panoramaxx brings together the 2.5 light state of the Vegaview with the Autopilot system found in the e684 helmets. Adaptive Shade Autopilot The adaptive shade level control automatically adjusts to the perfect shade level. Let me say that again so it sinks in. The Optrel Panoramaxx has an autopilot feature that automatically detects the amperage settings you're using and automatically adjusts the shade of the lens so you don't have to stop and manually make the adjustments. Going from grinding to MIG to TIG is no problem and no manual adjustments are needed. The Optrel Panoramaxx has an additional sensor that measures arc intensity and will automatically adjust the shade as the arc changes. This is a groundbreaking, unique feature that you will absolutely love. Unlike other adaptive lenses that rapidly return to light, the Panoramaxx uses a twilight feature that restores light more naturally after you're done with your weld, presenting a smooth transition to your eyes. This unique, Optrel-exclusive feature will reduce your eye fatigue and help you work longer and safer. The rechargeable lithium-polymer battery pack lasts hundreds of hours and the lens is recharged utilizing a micro-USB cable. The upper side adjustment knob moves the helmet shell up and down, allowing a higher or lower perspective while welding. 600% Larger Field of View. Weight - 19.4 oz. Shade range - 7-12 Auto Pilot. 2.5 Shade light state. Optrel Black Mesh Storage Bag. (1) Spare Front Cover Lens. Full of new, pioneering features such as Twilight technology and Adaptive Shade Autopilot. Protective Process: All Welding and Grinding applications. Size: one size fits most. The IOC in Welding Supplies stands for Indiana Oxygen Company. IOC has been a leader in the welding and gas industry since 1915, making us the oldest independently owned Welding Supply Company in the county. After all these years, were still a family owned company that is passionate about customer service and the products we sell. We like to think that we have some of the most knowledgeable customer service reps in the industry. The item "Optrel Panoramaxx Welding Helmet (1010.000)" is in sale since Friday, July 28, 2017.